It is impossible to overestimate the importance of the Victorian printing press. At every level of society there was an unprecedented demand for newspapers, penny novels, serials and periodicals. There was a thirst for knowledge created by the increasing literate proportion of the population, the growth of towns and cities and the increasing amount of leisure time available to the working man. 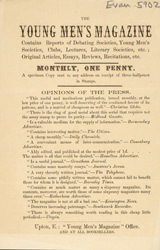 After the advertising tax was brought to an end magazines could be produced more cheaply and many new titles appeared often specialist and aimed at a particular audience, which in the case of the periodical advertised in this leaflet was young men.